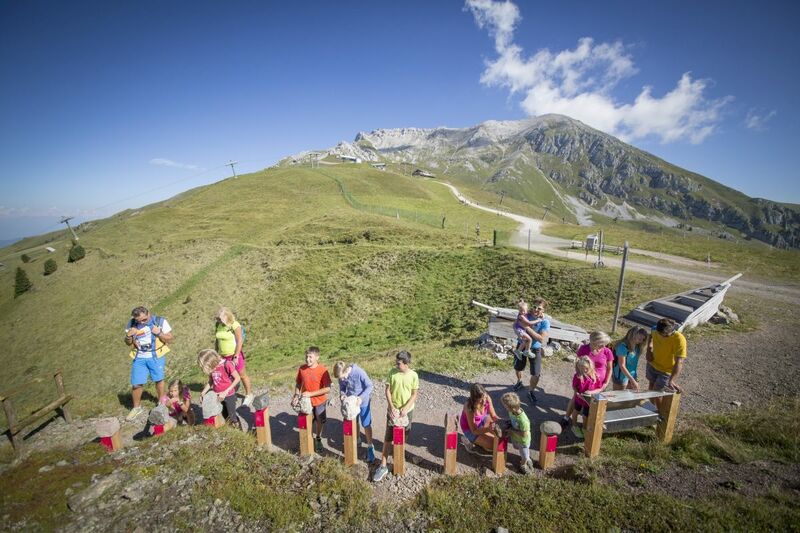 The Dos Capèl Geotrail is a walk of medium difficulty for children and families. Take the cable car to Gardonè, then the chair lift to Passo Feudo, the start of the Dos Capèl Geotrail, a circular walk of 3.5 km (2 miles) with a height gain of 268m (879 ft). The trail begins and ends in the same place, a few metres from the chairlift and the Passo Feudo Refuge. It’s sunny, with lovely views and takes about 2 hours, without need of a guide. The walk is suitable for families and children (up to 2 years they will need to be taken in a baby carrier backpack). Dos Capèl is 2200 m (7218 ft) above sea level in the Val di Fiemme. It’s at the foot of Latemar in Trentino, in the Dolomites UNESCO World Heritage. The best way to do the Dos Capèl Geotrail and discover the geology of these mountains is by using the clues and puzzles in the gamebook. You’ll need to be observant, and have a good memory and spirit of adventure. Come on a Wednesday and you can take part in the walking theatre performance “Geology on the High Seas”. 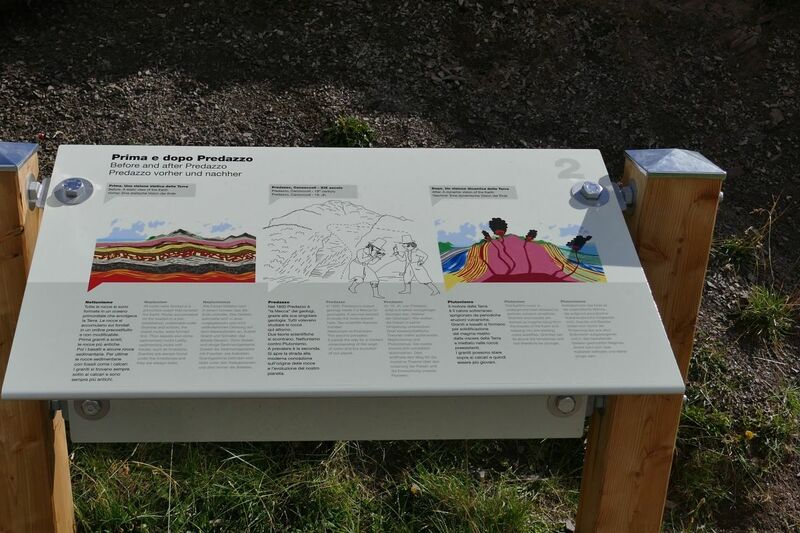 The Dos Capèl Geotrail is a themed walk with interactive stations curated by MUSE–Trento Science Museum and the Predazzo Geological Museum of the Dolomites. 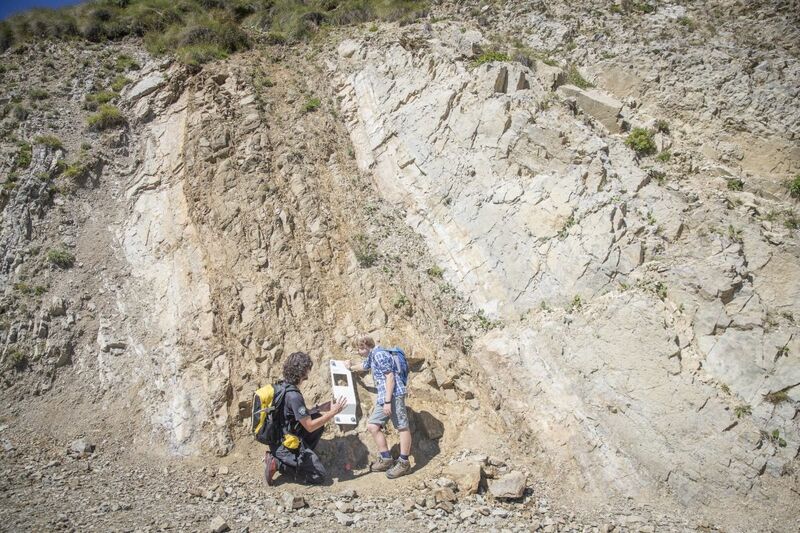 Of medium difficulty and suitable for children and families, it’s a great way to explore the beauty of Latemar, its geology and the Triassic era. 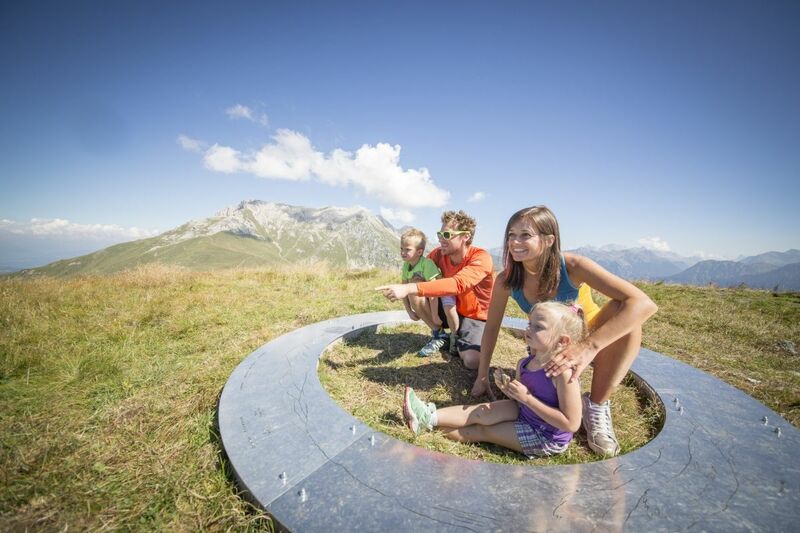 The Val di Fiemme mountains have plenty of wonderful surprises in store for families on holiday in Trentino. If you are looking for things to do with children, don’t stop at the first climb, for a fun day out on your family holiday try the Dos Capèl Geotrail. It’s a medium difficulty walk for children with family games to play on the way. The walk is circular with a 268 m (879 ft) height gain, and you don’t need to have a high level of fitness, just walking boots and a windproof jacket. It’s suitable for families and children, but the very young (up to 2 years) will need to be taken in a baby carrier backpack. The trail is at the foot of Latemar in Trentino, in the Dolomites UNESCO World Heritage. walk and play with your children, solve the puzzles, pick up rock samples – some come from a 250 million-year-old Triassic beach. Through the rocks you will be able to discover the Dolomites UNESCO World Heritage using the gamebook that you can find at the Info Point in Gardonè or at the Passo Feudo Refuge. The gamebook is suitable for children aged 8-12, but younger ones can follow the clues and have a world of fun if there is an adult along to play with them. 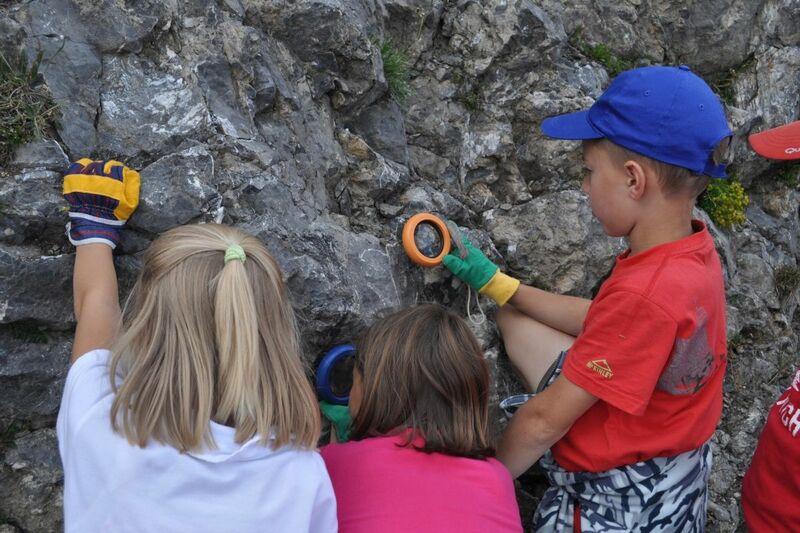 Get your geologist’s rucksack, which contains the things you’ll need to get the most out of this adventure: magnifying glass and glasses for observing the rocks, bags and gloves to collect samples. you can walk freely along the trail, train your eyesight and discover the rocks and landscapes of these beautiful mountains. To help you there are interactive stations curated by MUSE- Trento Science Museum and the Predazzo Geological Museum of the Dolomites, with illustrations by Bernardo Carvalho. 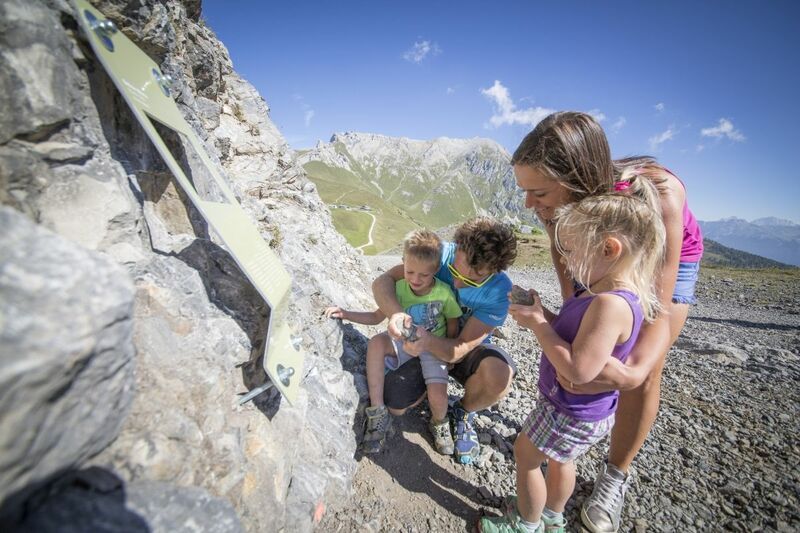 Along the Geotrail Dos Capèl you’ll find 13 interactive stations curated by MUSE- Trento Science Museum and the Predazzo Geological Museum of the Dolomites, which tell you all about the Dolomites. Your guide will be the illustrations by Portuguese artist Bernardo Carvalho and the ”Dos Capèl Geotrail, the Triassic World” gamebook. There are a few rules (there always are), 9 stops, 100 points to win and a handful of rock tokens, 9 geo-questions, and a prize that you can claim at the Info Point in Gardonè. Some of the prizes are made of wood by local artisans from designs by students of the G. Soraperra Secondary School for Art in Pozza di Fassa. You’ll leave here with a few gifts and souvenirs of your family holiday in the Val di Fiemme, near Predazzo. 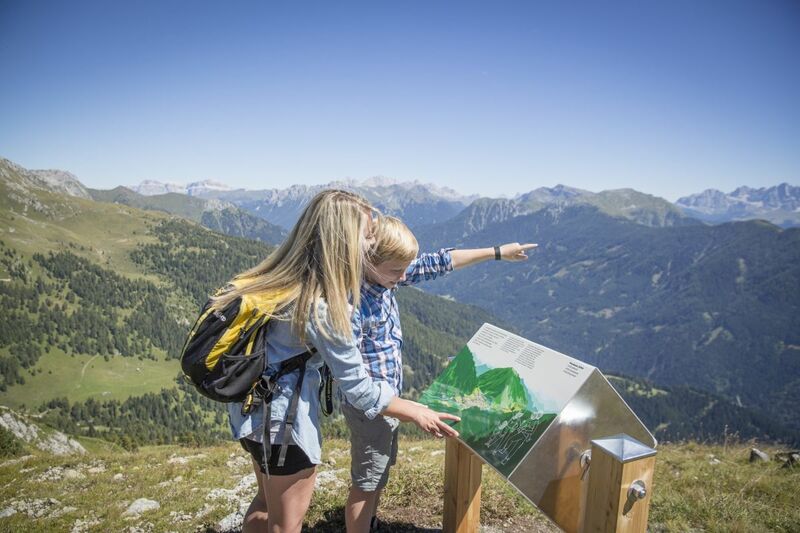 At the Info Point you’ll find someone to help you with everything: DIFR games, things to read on a range of topics, books and little souvenirs of your family holiday in Trentino, Val di Fiemme, near Predazzo. 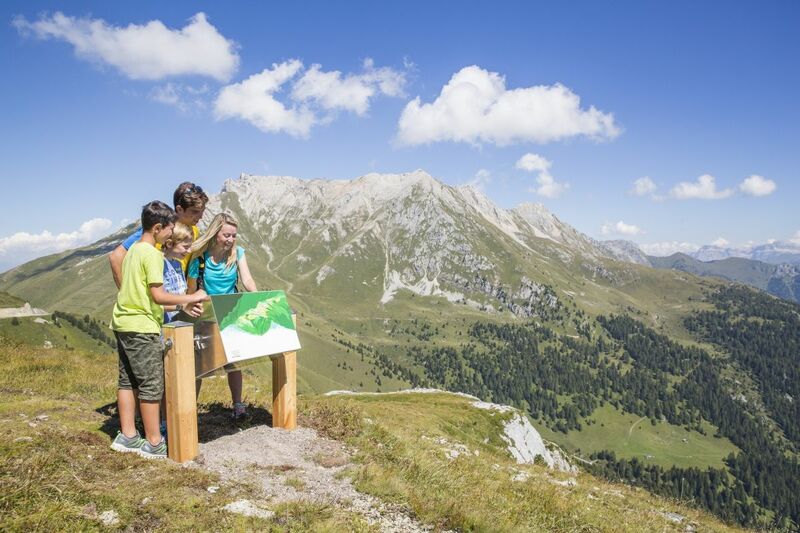 The Dos Capèl Geotrail is a walk of medium difficulty for children and families. Walk, explore the landscape, follow the clues and identify the rocks: Werfen, basalt, green breccia, traces of lava, Latemar limestone. “Cooked” rocks, broken and folded, coral reefs, volcanic veins, astonishingly beautiful colours and Dolomite landscapes. You will learn to recognise the rock walls of the Livinallongo formation, brown streaks of lava and the traces of a Triassic sea. How can you identify them? There are 13 illustrated stations along the thematic trail and your gamebook will be your guide. When you see the words “rock token”, look around and try to find a sample of the rock shown. 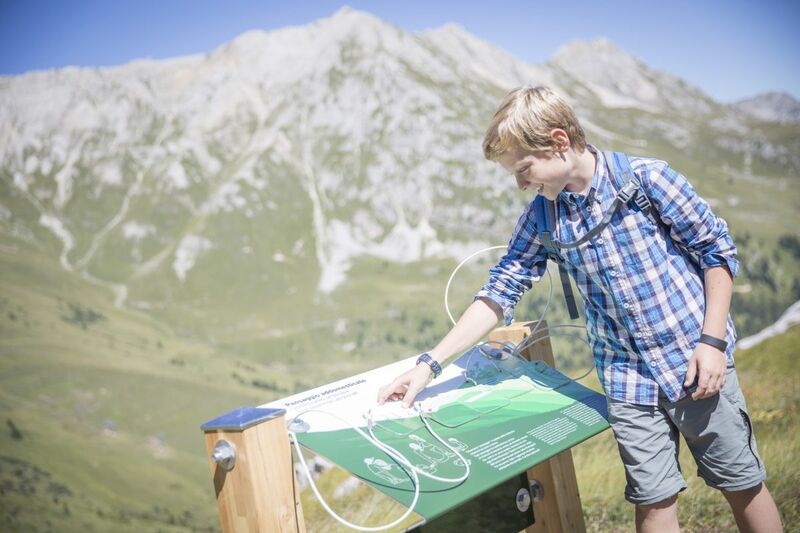 You can collect a small piece and further along the path you will be able to build a Dolomites geo-clock. You can touch, observe and smell the rocks, take small samples, and if you come on a Wednesday, you can take part in the “Geology on the High Seas” performance. 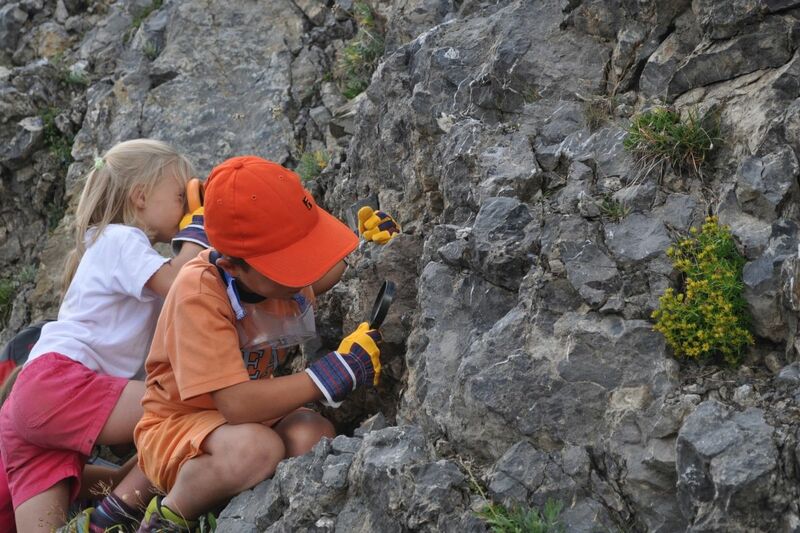 Having got a taste for discovery, once you’re back down in the valley you can visit the Predazzo Geological Museum of the Dolomites, where you can analyse small rock samples and ask expert geologists questions to deepen your knowledge of this fascinating subject. When you follow the Dos Capèl geotrail you’ll be observing and walking where courageous women ventured a couple of centuries ago: Mary Ogilvie Gordon – the world’s first woman to obtain a degree in geology – studied carbonate rocks and volcanic bodies, Elizabeth Tuckett loved to take notes in words and pictures of her travels, like comic books, and Amelia Edwards climbed mountain peaks and rocky pinnacles. Along the way try to reproduce the force of a tectonic thrust, trap lava as in an embrace and simulate the eruption of Predazzo’s volcano. Enjoy the views, close your eyes and turn around and when you stop try to remember the name of the mountain facing you, and hold your breath for the 9 geo-questions. We look forward to seeing you there!